OTTAWA - Employment Minister Jason Kenney says the Harper government has no intention of backing away from its income splitting pledge, despite a new report concluding the plan would exacerbate income inequality and bestow the most benefits to the West. Kenney made the statement in the House of Commons on Tuesday while debating an NDP motion to do away with the idea. 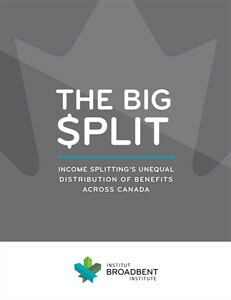 The report by the left-leaning Broadbent Institute concluded that income splitting would benefit the most affluent single-income families, cost about $3 billion, bestow no benefits to 90 per cent of Canadians, and transfer a disproportionate amount to families in Alberta and Saskatchewan, Conservative strongholds with the strongest economies. "We confirm that it is absolutely our intention to keep that commitment ... to introduce income tax fairness, to end the discrimination against certain families, to end the unfairness," Kenney declared. "We will treat the family as an economic unit because it is an economic unit," he added, arguing that a family that chooses to keep one spouse at home to care for children or the elderly should not be punished in the tax code for the decision. In 2011, the Conservatives pledged to allow the transfer of up to $50,000 from the higher-earning spouse in a family with children under 18 to the lower earner, thereby reducing the overall tax bite. It said it would introduce the legislation as soon as the budget is balanced. But while the proposal appears to be popular with Canadians, the latest Broadbent study — as have others before it — shows the vast majority of families would see no benefit, because they either have no children under 18, have spouses with similar incomes or are single-parent families. The latest study breaks new ground in finding wide regional disparity in how the benefits will be distributed. It turns out that among the target group — families with minor-age children — the biggest winners by far reside in Alberta, where the average annual tax saving would be $1,359, while families in Saskatchewan come in second at $1,070. Those two provinces, which have a combined 42 federal ridings, sent 40 Conservative MPs to Ottawa in the 2011 election. Families in Prince Edward Island would get the least average benefit at $488, followed closely by Quebec families with children, which would average $510 in benefits. Those two provinces were among the least productive for the Conservatives, electing only six Tories among their combined 79 MPs in 2011. By ascending order of benefits, qualifying Nova Scotia families would average $727 in benefits, followed by Manitoba ($772), New Brunswick ($787), British Columbia ($853), Ontario ($874) and Newfoundland ($925). Broadbent Institute executive director Rick Smith has no explanation for the regional disparity other than that the program as unveiled was designed for a particular type of family — the so-called "Leave It to Beaver" traditional home with a principal breadwinner and a stay at home spouse who takes care of the children. "It turns out there are few families of that type, but there are more of them in Alberta than in Quebec," he said. To benefit the most, one spouse must make $100,000 more than the other and have a taxable income above $136,270, the highest marginal rate. Of families with children under 18, the average tax saving is calculated at $841, although that includes the 54 per cent of those households that receive no benefit at all. But for 147,000 Canadian families with a high-income breadwinner, the average benefit would be $7,128. "If the government set out to specifically design a policy to make inequality worse, this would be it," Smith said. "This policy is an inequality generating machine." The lack of broad-based benefits is expected to be a major campaign issue should the Conservatives go ahead with income splitting in next year's budget. It was one reason cited by the late finance minister Jim Flaherty when publicly expressing doubts about the program earlier this year, touching off a fire storm among Conservative MPs who remain committed to seeing it implemented. Kenney was one of the ministers who publicly disagreed with Flaherty and said the government would keep its promise. Although polls show income splitting is popular, Smith believes one reason is that most Canadians assume they will benefit, when in fact they likely won't. Without seeing the results of the study, which was given to The Canadian Press prior to the official release Tuesday morning, Andrea Mrozek of the Institute of Marriage and Family said income splitting can be implemented "the right way" so as to spread the benefits more broadly. "We can implement this in a way that benefits a bigger group of families. For example, we have always looked at the French model, which allows a single parent to split with a child, so thereby benefiting from income splitting," she said. According to the Broadbent study, which was based on analysis by Tristat Resources, that would benefit an additional 20 per cent of families. Tax policy expert Jack Mintz of the University of Calgary believes unequal benefits are unavoidable, but can be at least partially mitigated by other means, including increasing the tax credit for child-care costs. Still, Smith says there are far superior ways of delivering tax relief to hard-pressed families, such as enriching the Child Tax Benefit for lower-income families, a similar conclusion reached by the authors of the C.D. Howe study. "We wouldn't be so concerned about this if it weren't so darn expensive," said Smith. "This would cost the federal treasury $3 billion a year, so we are talking about a wealth transfer from nine of 10 Canadians to the wealthiest amongst us."